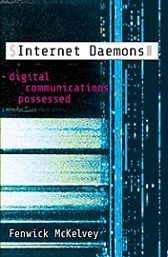 This book weaves together history, theory, and policy to give a full account of where daemons come from and how they influence our lives - including their role in hot-button issues like network neutrality. It asks important questions about how much control is being handed over to these automated, autonomous programs, and the consequences for transparency and oversight. We're used to talking about how tech giants like Google, Facebook, and Amazon rule the internet, but what about daemons? Ubiquitous programs that have colonized the Net's infrastructure - as well as the devices we use to access it—daemons are little known. Fenwick McKelvey weaves together history, theory, and policy to give a full account of where daemons come from and how they influence our lives—including their role in hot-button issues like network neutrality. Going back to Victorian times and the popular thought experiment Maxwell's Demon, McKelvey charts how daemons evolved from concept to reality, eventually blossoming into the pandaemonium of code-based creatures that today orchestrates our internet. Digging into real-life examples like sluggish connection speeds, Comcast's efforts to control peer-to-peer networking, and Pirate Bay’s attempts to elude daemonic control (and skirt copyright), McKelvey shows how daemons have been central to the internet, greatly influencing everyday users. Fenwick McKelvey is assistant professor of communication studies at Concordia University.